Today’s Sunday Snippet is from the book Death Is an illusion by Else Byskov. What is Death Is an illusion about? Death Is an illusion by Else Byskov is a spiritual book about a spiritual teacher called Martinus. Martinus will become much more prominent as a spiritual teacher, thanks to Else Byskov’s clear summary of his life and teachings. 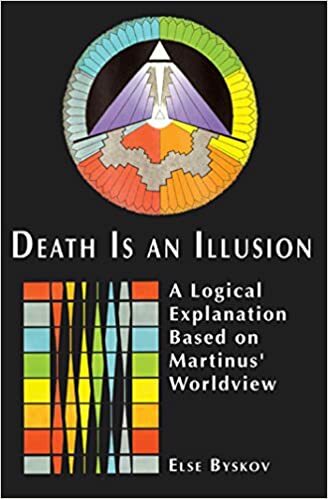 Death Is An illusion is a timely introduction to the Danish 20th-century mystic, Martinus (1890-1981) whose teachings have a sound picture of the cosmos and a perspective about the human future based on the evolution of consciousness. Martinus cosmology is an all-embracing world picture, a spiritual science that describes and analyses the spiritual laws of life. It leads to an optimistic view of life, and it provides the basis for a harmonious and empathetic relationship to all people and all living things. The vast majority of people living on Earth today live in ignorance about the process that all physical beings must undergo, the process of dying and its result – death. They believe that life ceases at death, that death is final, and that we have only one life. They desperately cling to this one life and many are very afraid of dying. But as we have read earlier, death as such, or death as a cessation of consciousness, does not exist. What we call death is only an exchange of bodies. In the chapter about the structure of the living being we saw that the “I” (or X 1), and its ability to create (X 2), survive physical death and that it is only the physical body or the part of X 3 that corresponds to the energy of gravity that becomes inanimate at death. Our other bodies, one corresponding to each of the basic energies, i.e. our body of feeling, our body of intelligence, our body of intuition, our body of memory and our body of instinct, all of which are reflected in our aura, live on after the death of the physical body. These bodies constitute an electrical field or a field of energy, and this field of energy is eternally connected to X 1 and X 2. As we have a body for each basic energy, each of which is at a particular level of unfolding depending on the strength of the basic energy in question at the time, our day-consciousness is taken over at the time of death by the next body in line, in our case the body corresponding to the energy of feeling. People who have had near-death experiences unanimously claim that losing their physical bodies did not mean losing their consciousness. They relate how they hovered above their physical bodies. Many saw that their physical body was dead, but they were very much alive, in fact they were feeling fine and actually much better than when they were in their physical body. They had no pain; they felt light, unencumbered, and free. As the spiritual bodies consist of matter that is thousands of times lighter than physical matter, it is no wonder that a feeling of great freedom invades the beings at the moment of severance from the physical vehicle. Especially when the physical body has been rendered more or less useless through old age or injury it is obvious that being severed from this must convey a feeling of great joy. What is very clear from accounts from near-death experiencers is that consciousness does not cease at the time of physical death. But then what happens? Martinus gives us a very full explanation of this in his book: The Way to Paradise and in the leaflet Through the Gate of Death – Sleep and Death. In these two writings Martinus reveals what happens when we shed our physical body. Death is a new birth in exactly the same way as our physical birth is a birth into this level of existence. Our birth on the physical level is a birth to an existence in the heavy physical matter, and our death is a birth to an existence on the much lighter spiritual level. We have all experienced dying millions of times before, so this process is something that we are very used to, although we cannot remember our former deaths with our present level of unfolding of the energy of memory. We saw earlier that the energy of memory has a very weak degree of unfolding at our present stage in the animal / human kingdom. This energy is so weak at this point that we cannot even remember all details from our present physical incarnation, we cannot remember all episodes from our childhood – indeed some people cannot even remember what they did yesterday. So, in view of this it is no wonder that we cannot remember our previous deaths, not to mention our previous lives. However, regression therapists have shown that this memory can be accessed through hypnosis, thus enabling the individual to relive some of their previous deaths. In these cases, the experience of death was always a very pleasant one, so there is absolutely no reason to fear death, as we shall soon see. All those who have had a near-death experience lose all fear of death and unanimously say that being “dead” was very pleasant. They also become convinced that there is life after “death”. So, if we listen to those who “have been there”, it becomes clear that there is nothing to be afraid of. If you like what you have read so far on Death Is an illusion by Else Byskov, you can buy a copy of the book via your favourite retailer or on Amazon. This entry was posted in Sunday Snippets and tagged book preview, Death Is an illusion, look inside book. Bookmark the permalink.